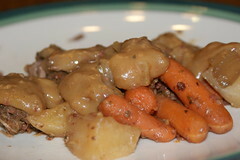 We were so hungry when I made this easy to make slow cooker that I forgot to take pictures! Place the potatoes, onion, and carrots into the slow cooker. Cut the steak into six pieces and place meat on top of the vegetables. In a mixing bowl, combine the soup mix, soup, and water. Then pour the mixture over the beef. Cover and cook on low for 7 - 10 hours.